Legendary artist John Van Hamersveld, known for creating the iconic The Endless Summer poster collected by the Museum of Modern Art, unveiled a one-of-a-kind 510-foot round mural in a tribute to the city of El Segundo and local surf legends. On a site with sweeping views of the Pacific Ocean, the striking graphic-driven mural marks the completion of the Los Angeles Department of Water and Power's (LADWP) Scattergood tank renewal project. 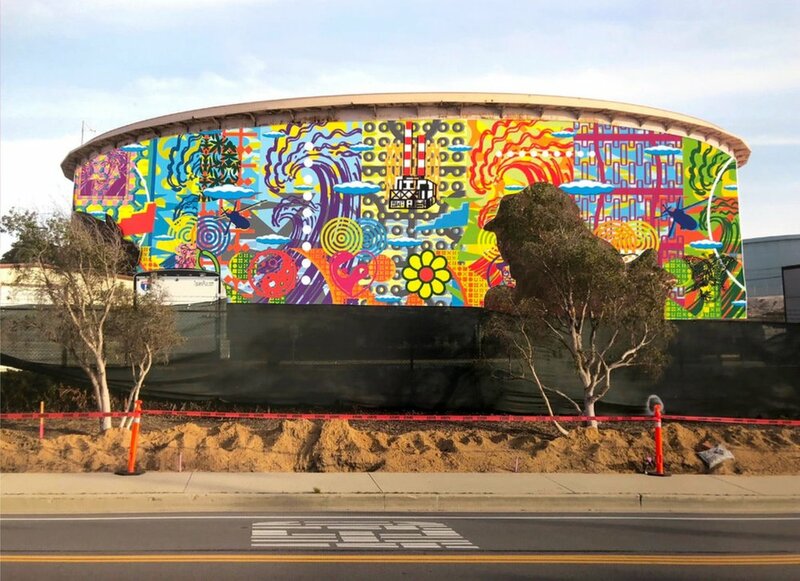 The mural is located on a LADWP-owned tank on west-east-running Grand Avenue, which extends through the city of El Segundo from the Pacific coastline to the Pacific Coast Highway and beyond. The artwork is composed of 51 visually-striking, colorful panels (10-foot by 32-foot each), and incorporates Van Hamersveld's signature style and iconic imagery. Central to the theme are 15 bright, bold waves and symbols and images of Van Hamersveld's life experiences and pop culture, including a Volkswagen to represent his drive along the coast to El Segundo High School from his home in Palos Verdes, and aviation imagery representing El Segundo as the aerospace capital of the world.